Our Baby Mommy came over today with little bit and this is what she was wearing. I could have just pinched both of their cheeks. 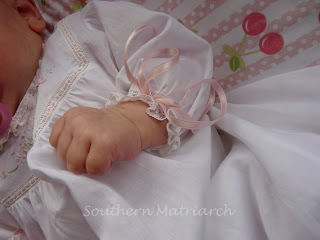 Don't you love the look of that tiny hand trimmed in lace and silk satin ribbons? I love this gown. It is sewn completely by hand. I posted about just the gown here. It was a convention class from the 2009 SAGA convention. 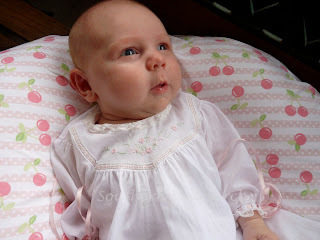 What is even more special about this gown is, it was the project I was working on last Thanksgiving when we first learned of little bit's impending arrival. 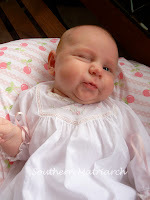 I know we are obnoxious fools for this baby, we can't help ourselves. I loved being a mom more than anything in the world, but I love babies! 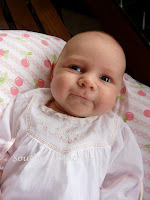 I have been waiting for another baby in the family since our youngest child was no longer a baby. And not only is she beautiful, but she is entertaining as well. Okay, I'll stop now. Don't forget to enter the Sew Beautiful Blog tour giveaway. Go here to leave a comment. Winner to be drawn September 15th. I enjoy seeing your beautiful grandbaby and her lovely clothes; you can never show too many cute pictures! Thanks for the inspiration! My little boy is just 3 months, so it's fun to see "little bit" growing along with him! No, you are not an obnoxious fool, just a normal grandmother. She is just adorable, and the gown is absolutely lovely. Which CN issue is it in? I may have it. Oh man... that is precious! I need to pull mine out and finish it. she gets sweeter by the day!! Love the gown!!! What a beautiful baby in a beautiful gown! This gown is so inspiring. I think I'll go and sew now. Wow! 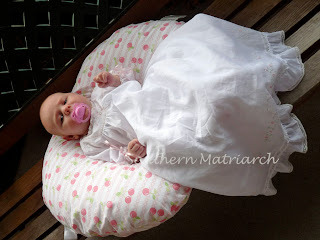 That gown just looks gorgeous on that beautiful little one! Your work is truely exquisite. You go right ahead & be an obnoxious fool...you've earned the right!! She is just beautiful & I, too, am in love with the tiny hand circled with hand stitched lace & ribbon. I think you should crop it down & then frame it for your new sewing room!! Or, better yet put it side-by-side in a double frame with the full length shot of her in this gorgeous gown. Becky?? Are you out there?